Where can I find jobs in Mesa AZ including the SE Valley? A reader back east emailed about jobs in Mesa AZ. Here’s a page to help you find Mesa employment. What kind of jobs can you find around Mesa, Gilbert, Chandler, Apache Junction and Queen Creek? What’s it like to live in one of these cities? They are all suburbs and many people commute to Tempe and Phoenix with even more jobs. Why work in the east valley of Phoenix? Lots of people move here because of the work and family. We did. Then a lot move here to escape the cold. We did. We laughed goodbye to the winters of Reno Nevada with white-outs in the winter, and the jackets on the 4th of July in the summer. 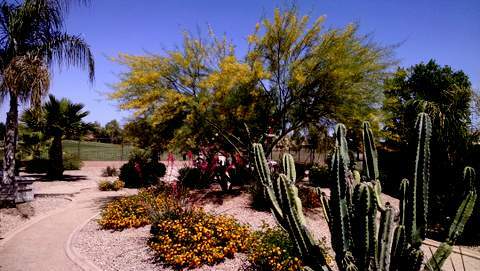 Arizona gets over 300 cheerful sunny days per year. You might even be able to wear shorts on a sunny Christmas day! “Oh but I like the seasons!” You can always drive up to the mountains to see the seasons and the snow and the pine trees. Then come down to the valley where the jobs are. In the past you got a paper, looked at the want ads and circled the jobs. Trouble is that newspaper ads are only a small fraction of the available jobs. So if you are reading this, then you know how to use a computer. That’s good because many employers only accept online job applications and resumes. With the internet you can look for jobs anytime, anywhere, on holidays, etc. Don’t have a computer? Most city libraries have ones that you can use. What are the major employers in the east valley? In the near future there will be huge developments with lots of jobs. Like the Mesa Riverview outdoor Mall. At the other end of Mesa is the future Gaylord Entertainment Resort and Convention Hotel at the old GM Proving Grounds site. And lots and lots of new homes. Where can I find the government jobs around the cities in the SE Valley? Where can I check the online job sites? The local newspaper is the Arizona Republic and their website is AZcentral.com.